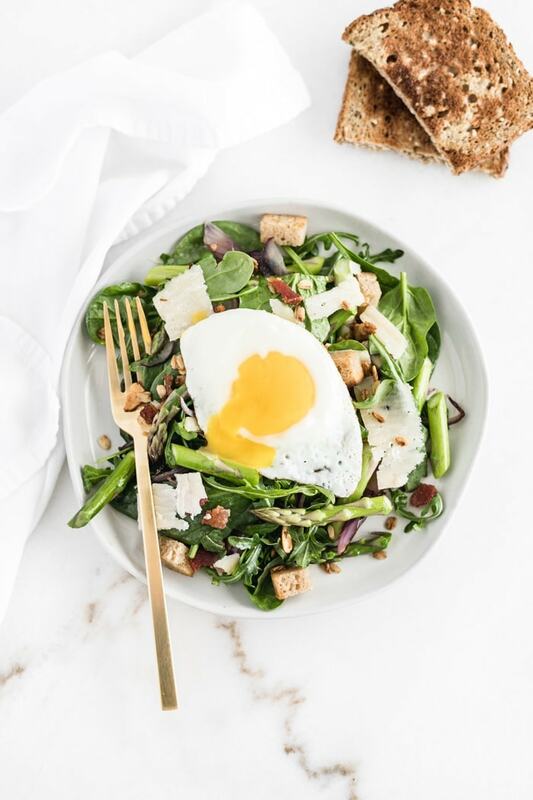 Get your veggies in first thing in the morning with a healthy and delicious spring breakfast salad topped with maple vinaigrette and a runny fried egg! Stop looking at me like that. I know what you’re thinking. Salad for breakfast? Yes, salad for breakfast. Why not? Nobody ever said you couldn’t have salad for breakfast. Plus it’s got an egg on it, so it’s a perfectly acceptable breakfast meal. In an effort to get more protein for breakfast, I started making eggs just about every day. Sounds great in theory, until you get tired of eating eggs the same 3 ways, 7 days a week. So I decided to get a little more creative with my breakfasts. I love eating lots of veggies in the morning because the fiber keeps me full, so I thought, why not make a salad? 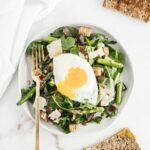 The key to making this breakfast salad, well, breakfast-y (besides the delicious runny egg on top) is incorporating traditional breakfast flavors. In this one, I used a bit of bacon, crunchy granola, sourdough croutons, and a delicious maple dressing (just be sure to use 100% real maple syrup to make it work). I think crumbled chicken sausage would be excellent on it, too! But if you don’t dig meat with breakfast (or at all) then you can absolutely leave it out. Though the egg is mandatory, because lets face it, everything is better with an oozing, runny egg. 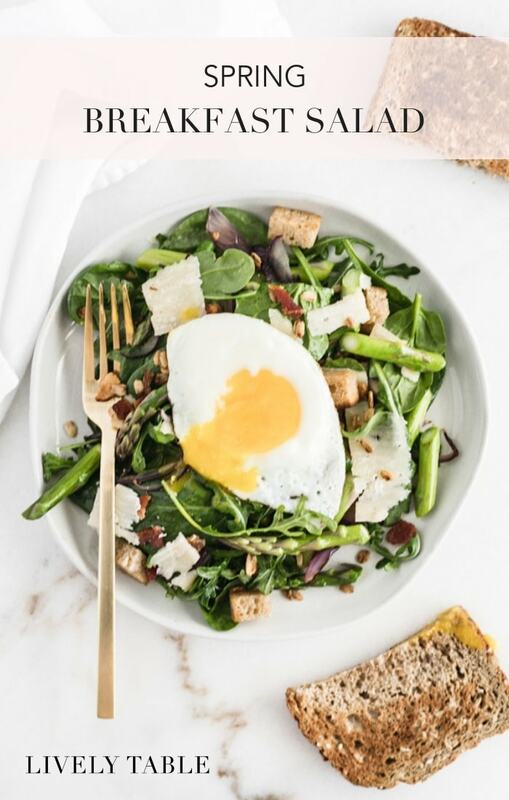 And since you’re getting at least two full servings of veggies in this breakfast salad first thing in the morning, you know you’re starting your day off with a super-nutritious meal. You’ve got protein, veggies, and whole grains all in one. It will make you feel good throughout the day and keep you going until lunch. 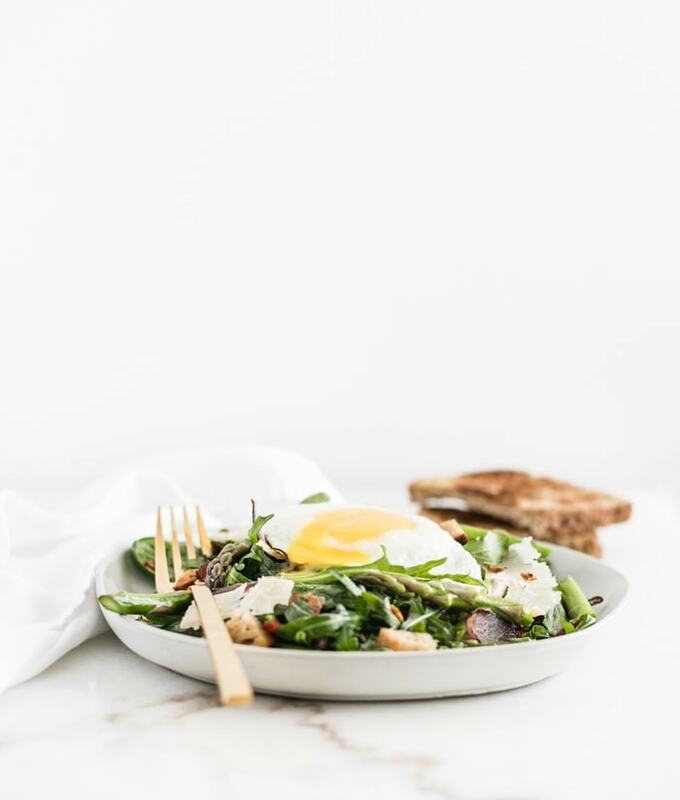 If you’re looking for a way to incorporate more vegetables into your diet, or just want to switch up your breakfast routine a little bit, I encourage you to try a breakfast salad! It may just become your new favorite thing! 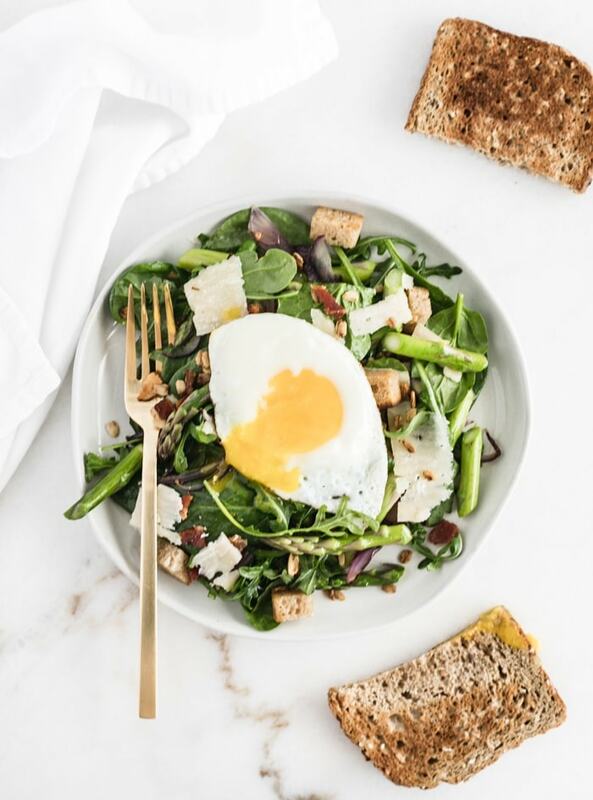 Get half a day’s worth of veggies first thing in the morning with a healthy and delicious spring breakfast salad topped with a maple vinaigrette and a runny poached egg! Cook bacon in a small skillet. Drain and set aside. Wash a cut asparagus into 2-inch pieces. Add onion and asparagus to skillet and cook until onions are softened and asparagus are bright green. Remove from pan. Add sourdough cubes to pan and toast, tossing occasionally, to brown the outsides. In a large bowl, combine spinach, arugula, onions, and asparagus. Add dressing and toss it all together. Divide between two plates or bowls. Top each with granola, bacon, and parmesan. 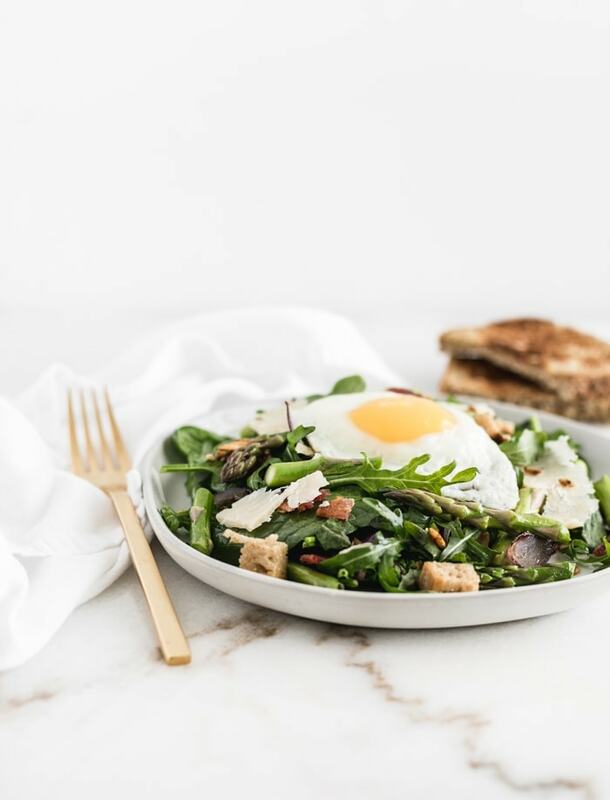 Place a poached or fried egg on top of each salad and serve immediately. I like the idea, just not the runny egg (not my thing). I’ll try it and do the egg with a solid yolk!